The objective of this brief paper is to help you understand how to protect your greatest worldly asset on behalf of your family and your business, if you own one. The greatest asset that is referred to in this paper is your ability to earn income. Three major things that reduce or eliminate your ability to do this are illness, disability and death. The following statistics are gathered from sources listed at the end of this paper and are current to Dec 31st 2018. The budget introduces a new Innovation Equity Tax Credit which will take effect from January 1, 2019. 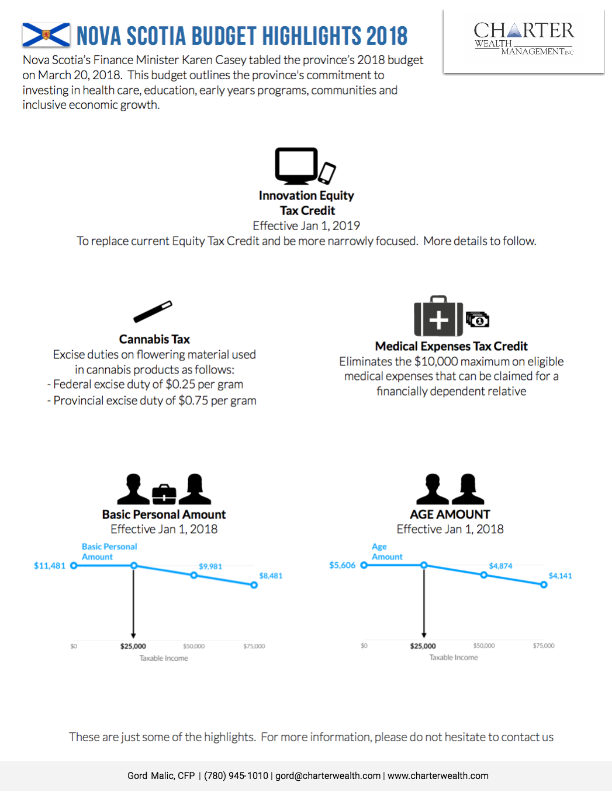 The specific details are not yet set out but the budget states that the existing Equity Tax Credit will be phased out and the new program will have a less broad focus and the threshold will be more in line with comparable programs across Canada. The budget covers the agreement made by Nova Scotia to adhere to a structured tax framework with the Canadian government for a period of two years after the legalization of cannabis for recreational purposes. Specifically, excise duties will be imposed on the flowering material that is used to create cannabis at $0.25 per gram federal excise duty and $0.75 per gram provincial excise duty, both to be collected by the federal government. In relation to the Medical Expenses Tax Credit, the $10,000 cap on eligible medical expenses that an individual can claim on behalf of a dependent relative has been eliminated in this year’s budget. The budget confirms that, effective January 1, 2018, the basic personal amount, as well as the spousal amount and that for an eligible dependent, will rise from $8,481 to $11,481, with those earning a taxable income of under $25,000 receiving the maximum benefit. Also effective January 1, 2018, the age amount credit for seniors with a low income will increase from $4,141 to $5,606 and the maximum benefit will apply to those with a taxable income of less than $25,000. The end of the year provides a great opportunity for business owners to consider ways to improve their tax position. As a business owner, there’s still time to manage taxes for yourself and your business for 2017 before the end of the year. It is particularly important this year that you consider year-end tax planning keeping in mind the government’s private company tax proposal which may result in increased taxes in 2018 for private companies and their shareholders. As a business owner, you should be aware of how these changes will affect your company and your financial situation. Please set up a meeting with us and your tax advisor before the end of the year to review how these changes will affect your situation. The possible effects of the private company proposals on you and your company. You may want to pay yourself enough salary to contribute as much as you possibly can towards an RRSP. The same goes for any family member employed by you. The maximum contribution you can make is 18% of the previous year’s earned income, up to a limit of $26,010 for 2017 and $26,230 for 2018. Keep in mind that the salary paid must be reasonable for your company to get a tax deduction. The downside to this, is that if your business is in a situation where you can suffer from economic downturn, then paying out a big salary in a profitable year will reduce the likelihood of recovering corporate taxes paid, if a loss materializes. You may want to consider employing your family members and paying them an appropriate salary if they provide services to your incorporated business. The business will benefit from a tax deduction on the salary paid, as long as it is reasonable in light of the services they provide (Example: administrative work, bookkeeping, acting director). Usually, a salary is considered “reasonable” if the services are genuinely being provided and the salary is similar to arms’ length comparables. Remember to weigh in the costs of payroll taxes and CPP contributions against the potential tax savings. 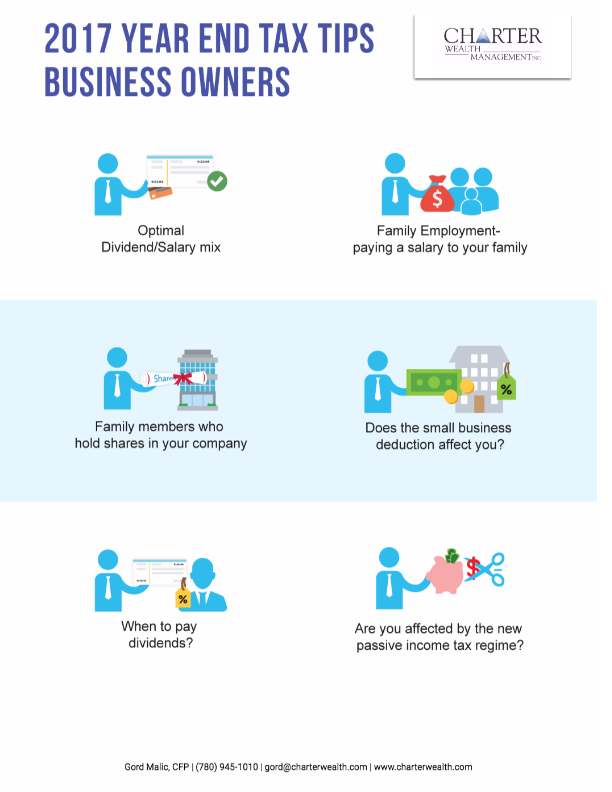 Consider paying additional dividends in 2017 to your family members who hold shares in your company, before the new tax on split income regime comes into effect in 2018. If the dividends amount these individuals receive is “unreasonable” under the circumstances, they will be taxed at the top marginal tax rate (regardless of their own personal tax rate). The new proposed rules are targeted at family members aged 18-24. The “reasonableness test” examines labour and capital contributions to the business, risk assumed and previous remuneration. You should review your tax situation with your tax advisor including your family company’s organizational structure on a go-forward basis to ensure you satisfy the new “reasonableness test”. Does the small business deduction affect you? Can your business claim a small business deduction? The current small business deduction is $500,000. The small business tax deduction will be worth more to your company this year than it will be in 2018, because the small business tax rate will be decreasing from 10.5% in 2017 to 10% in 2018 and will be down to 9% in 2019. If your corporate group claimed more than one small business deduction, the 2016 federal budget introduced several changes which were intended to limit the multiplication of the small business deduction through the use of certain partnerships and corporations. Please review this with your tax advisor. When to pay dividends: 2017 or 2018? Deciding if to pay dividends in 2017 or 2018, consider that the income tax rate for non-eligible dividends (generally, dividends that are paid from a company’s income that were taxed at the small business tax rate or as interest income) is increasing slightly in 2018. The federal tax rate is going up 0.34% from 26.30% in 2017 to 26.64% in 2018. A non-eligible dividend of, say, $100,000 out of your company in 2018 can save you at least $340 in absolute tax savings if paid in 2017 instead. These savings can be even higher if the provinces also announce increases to their 2018 tax rates for non-eligible dividends. The following provinces have announced increases: Ontario, New Brunswick and British Columbia. Please also note that the top personal rate is also increasing. Are you affected by the new passive income tax regime? The rules being introduced by the government in 2018 can potentially eliminate the financial advantages of investing passively through a private corporation. As a result of these rules, it will soon become less beneficial to earn investment income in a company and distribute non-eligible dividends, than it will be to earn investment income personally. More details are expected to be announced in the Federal Budget 2018. The government made an announcement on October 18, 2017, that passive investment income below a $50,000 annual would face no tax increase and confirmed that the new rules would apply on a “go-forward basis”. According to the government this $50,000 threshold is intended to allow you to build up passive investments to help cover things like income fluctuations, start-up costs or maternity leave. The government has also stated that passive investments that have already been made by private corporations’ owners will be “protected” (this includes future income earned from these investments). There is still clarification required on when these rules will take effect and how the government intends to implement these new rules. This is in an imperative year to do a year-end review of your personal and business finances. Talk to us, we can help. http://charterwealth.com/wp-content/uploads/2017/04/charterWealth.jpg 0 0 Charter Wealth http://charterwealth.com/wp-content/uploads/2017/04/charterWealth.jpg Charter Wealth2016-11-23 04:56:002016-11-23 05:08:42How much is a million? Having a buy sell agreement is important business partners. A buy-sell agreement should outline the contingencies for different outcomes, trigger events and be put in place to protect you. Often Buy-sell arrangements are also insured. The importance of a financial plan. Working with us to create your financial plan helps you identify your long and short term life goals. When you have a plan, it’s easer to make decisions that align with your goals. We outline 8 key areas of financial planning. Effective January 1, 2017 new tax legislation will come into effect that may affect your life insurance policy.